GUYS! HI! HI HI HI HI HI! I have something very important to say… S’mores Pie. Yes, I said it. I made a S’MORES PIE. I almost sprained my fingers typing out this post because I’m so damn excited to share the recipe with you. It’s freakin’ legendary. There’s really nothin’ much better than this S’mores Pie. It’s like a S’mores reloaded. 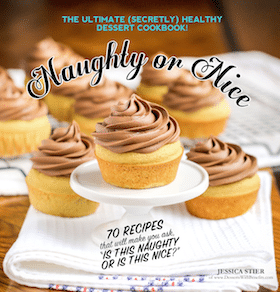 From the comforting graham cracker crust to the decadent, silky smooth chocolatey filling, to the from-scratch, cloud-like marshmallow fluff topping, you’ll find it hard (read: impossible) to say “no” to another bite. Awwww yeahhhh. 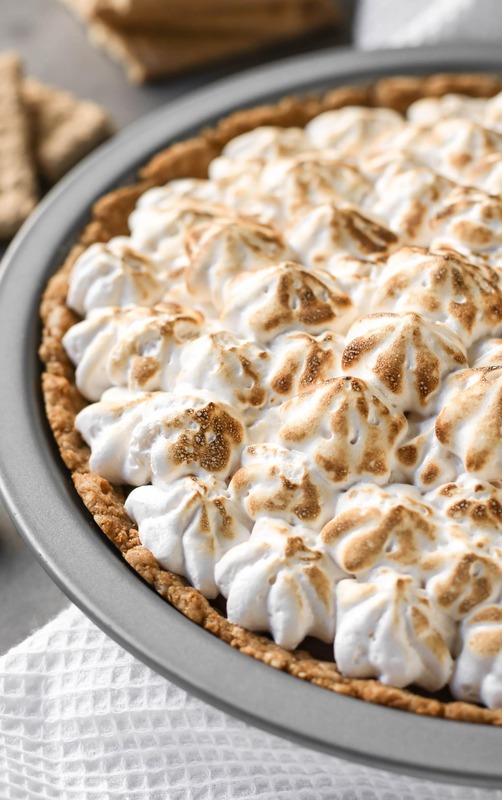 We’ve got a buttery and delicious graham cracker crust, a rich and creamy dairy-free chocolate filling, and a refined sugar-free marshmallow fluff topping. And what I consider to be happiness slipped in there too. 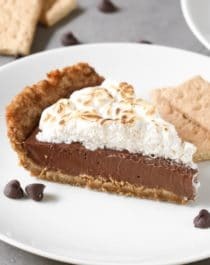 This decadent S'mores Pie has a deliciously comforting graham cracker crust, a rich and creamy chocolate filling, and a homemade marshmallow fluff topping. Preheat your oven to 350 degrees Fahrenheit. Take the pie crust out of the fridge and let it thaw at room temperature for ~45 minutes, or until soft and dough-like. In a large bowl, stir together the graham cracker crumbs and melted coconut oil. Then, dump in the softened pie dough and mix together with your hands. Press the mixture into two 8” pie pans. Bake for 10 minutes. Let cool completely. Place a double boiler over medium heat with about 2” of water. In the top portion of the double boiler, whisk together the erythritol, cocoa powder, corn starch, and just a splash of the coconut milk, until completely smooth. Then whisk in the remainder of the coconut milk. Whisk occasionally. When the water in the double boiler starts to boil, whisk the mixture constantly. It should seem like it’s not going anywhere for a while, then it will thicken quite suddenly. When this happens, turn off the heat but keep whisking the mixture over the double boiler for ~1 minute, or until it’s thick like a pudding. Remove the top portion from the double boiler and whisk in the vanilla extract. Add the chocolate and let sit for 1 minute. Whisk until completely smooth. Pour the mixture into the pie crusts and let cool at room temperature for ~2 hours. Cover with plastic wrap touching the surface of the filling. Refrigerate overnight. 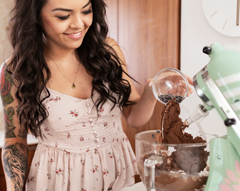 In a stand mixer fitted with a whisk attachment, add the egg whites and turn on high speed. In a small saucepan over medium-high heat, add the agave nectar. Add a candy thermometer and cook until it reaches 160 degrees Fahrenheit. While that is heating on the stove, add the erythritol and salt to the whipping egg whites. When the agave reaches 160 degrees, remove it from the heat and add it to the whipping egg whites in a VERY SLOW AND STEADY STREAM along the side of the bowl. Whip on high for 6 minutes total, adding the vanilla paste in the last minute. Mixture should be firm, thick, white, and glossy. Spoon or pipe the mixture over the pies, then toast with a kitchen torch. Serve immediately. You can try subbing the granulated erythritol with a granulated sweetener of choice (like organic cane sugar) if you like! I’ve been making S’mores Pie for years now. The first time I ever made one was in 2011 during my freshman year in college! Since then, I’ve made plenty of variations. Sometimes with a graham cracker crust, sometimes with a Gingersnap Cookie base. Sometimes with a chocolate cream cheese filling, sometimes with a Chocolate Silk Pie filling. Sometimes with a thick marshmallow topping, sometimes with a marshmallow-fluff-like veil of drippy, sticky goodness. You can still enjoy S’mores — the all-time classic campfire treat — even without the campfire! This S’mores Pie is incredibly unique, fun to make, and mind-blowing to eat. You definitely need to make it for yourself. This is pure comfort in a pie pan… but without the excess sugar and artificial ingredients. Oh, S’mores Pie, I love you. This looks absolutely dreamy! Love your blog! Love the photos! The pie looks really inviting! Lovely!!! Can I substitute sucanat with brown sugar? Yes, you can! You may need to reduce the honey by a tsp or tbs though, as brown sugar is more moist than sucanat. That smores pie looks delicious! Good idea. What kind of protein powder are you using? Ok so you can sub brown sugar for sucanat, do you think I could sub granulated erythritol too? All I can seem to find is just 100% cane sugar. I am making this for a thanksgiving get together but I’m also trying to watch my sugar intake. What’s a girl to do? lol Also, can I add extra vanilla in place of the paste? I can only find this online as well and the order won’t show up in time. If not this, then I’m bringing you pecan pie instead 🙂 Thanks for being our test kitchen Jess! Yup, brown sugar can replace the sucanat and cane sugar for the erythritol… but you can use all brown sugar if you like, it will just increase the calories and sugar in the recipe. Can we substitute the erythritol with something else? Like powdered stevia? Iam not from US, it’s hard for me to find erythritol, so can I sub with regular sugar? This looks amazing!! Can’t wait to make this one! 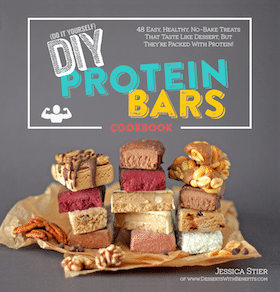 Do you think it will work with a vegan protein powder? I don’t like using whey or soy protein powders for allergen/hormonal side effects they have. Hey, I was noticing this awesome vegan recipe (per your permanent buttons on the side) but then noticed it has whey and eggs (which are, as you know, not vegan). I just pinned a lot of stuff from this website only to find out that it’s not vegan. Why do you have those permanent buttons on the side that says vegan, sugar free, etc and not follow it? It’s a little misleading. Just checked. It’s a tag. You might want to specify that. Thanks! I’m not sure how that happened because nowhere on the page does it say the pie vegan. I checked the tags/categories and it’s not under “vegan” either… ??? Actually, it does. 🙂 On the right hand side, you have a list of green circular buttons that are tags. It starts off with gluten free, then vegan, and so on. S’mores pie? Thats healthy?! I’m so in! Haha, just found your blog and I love it! !